Martin Alan Kazlev Exposed: Alan Kazlev: Crank & Crackpot? Alan Kazlev: Crank & Crackpot? On Wikipedia, a Kazlev fan started a wiki-page for him and the page was suggested for deletion. The majority of editors agreed that the page should be deleted and some referred to Alan Kazlev as a "crank" and "crackpot". Delete - looks like a crank, fails by any reasonable definition of notability. Delete Crackpots need to cause quite a stir in order to be notable enough for inclusion. I see no stir. Certainly a crank. 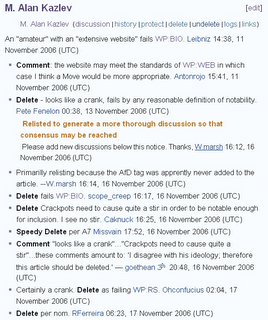 Delete as failing WP:RS. clings to this belief in the face of all counterarguments or evidence presented to him. Common synonyms for "crank" include kook and crackpot. Cranks vastly overestimate their own knowledge and ability, and vastly underestimate that of acknowledged experts. Cranks love to talk about their own beliefs, often in inappropriate social situations, but they tend to be very, very bad listeners, and often appear to be utterly uninterested in anyone else's experience or opinions. Some cranks exhibit a lack of academic achievement, in which case they typically assert that academic training in the subject of their crank belief is not only unnecessary for discovering "the truth", but actively harmful because they believe it "poisons" the minds by teaching falsehoods. Others greatly exaggerate their personal achievements, and may insist that some alleged achievement in some entirely unrelated area of human endeavor implies that their cranky opinion should be taken seriously. Some cranks claim vast knowledge of any relevant literature, while others claim that familiarity with previous work is entirely unnecessary; regardless, cranks inevitably reveal that whether or not they believe themselves to be knowledgeable concerning relevant matters of fact, mainstream opinion, or previous work, they are not in fact well-informed concerning the topic of their belief. Now read Alan's scrapped "Disrespectable Me" and "Introduction" page. Funny enough, Alan's friends (Robert Priddy and Sanjay Dadlani) also fit the definitions for a "crank" and a "crackpot".